I read this article and found it very interesting, thought it might be something for you. The article is called Centre’s Health, Education Spending Declines Over 2 Years and is located at https://archive.indiaspend.com/cover-story/centres-health-education-spending-declines-over-2-years-13686. The money allocated for key centrally sponsored social schemes—Integrated Child Development Services (ICDS), Sarva Shiksha Abhiyan (SSA or universal education programme) and National Health Mission—declined 10%, 7.5% and 3.6%, respectively, over two years. Over the same period, money set aside for Swachh Bharat Mission (Clean India Mission) increased almost three times. ICDS, SSA and the National Health Mission were carried over from the previous government. The Clean India Mission was started by Prime Minister Narendra Modi. The cut in social-welfare funding is part of on-going devolution reforms aimed at giving states more money without spending conditions imposed from Delhi. States, however, could not match central funding, IndiaSpend reported in February, using the latest data available, from two years ago. The Bharatiya Janata Party-led National Democratic Alliance (NDA) government cut funding for centrally sponsored schemes 19% last year, and the trend continued this year in budget announcements. While funding for NHM and SSA increased 2% over last year, it is lower than what it was before that. There was a 55% increase in tax money transferred to the states unconditionally, as IndiaSpend reported, based on a study by Accountability Initiative, a New Delhi-based think tank. But some states got less money than before devolution transfers. The 12th Five Year Plan allocated Rs 123,580 crore to ICDS. However, up to financial year 2016-17, the last year of the plan, the central government allocated only 63% of the planned ICDS budget. National Rural Health Mission (NRHM) allocation in financial year 2015-16 was only 79% cent of the larger National Health Mission, of which NRHM is a part. The central government provided 57% of the allocated SSA budget till September 2015. Of the states’ share, no more than 27%, on average, had been released by September 2015. Slow release of money and funding cuts has led to implementation problems, according to Accountability Initiative budget briefs. Money has been cut for ICDS, the world’s largest programme for maternal and child care, at a time when 42% of children are underweight and 40% below average height in India, IndiaSpend reported. Rs 850 crore ($130 million) was the National Nutrition Mission budget to combat child malnourishment, doubling from 2015-16. This Mission supplements ICDS. Data from the first round of National Family Health Survey-4 (NFHS 4) of 13 states and union territories reveal improvement in maternal and child health, IndiaSpend reported. Data from the most backward states of India such as Odisha, Jharkhand and Uttar Pradesh have not yet been released. As much as 97% of money spent on the Swachh Bharat Mission between April 2015 and February 2016 was on construction of individual household latrines, according to this Accountability Initiative study. Information, education and communication for sanitation and hygiene accounted for 1% of expenditure, a three percentage point drop from 2014-15. Changing attitudes is a critical need, as IndiaSpend reported, in an investigation of the Prime Minister’s claim that toilets had been built for girls in every school. Over the last two years, less than half of eligible households that applied for a toilet-construction grant actually received it, according to Accountability Initiative’s district survey. No more than 23% of the money approved for the universal education programme was spent till September 2015. As many as 31% of schools surveyed by Accountability Initiative across 10 districts in five states had not received annual school grants till December 2015. 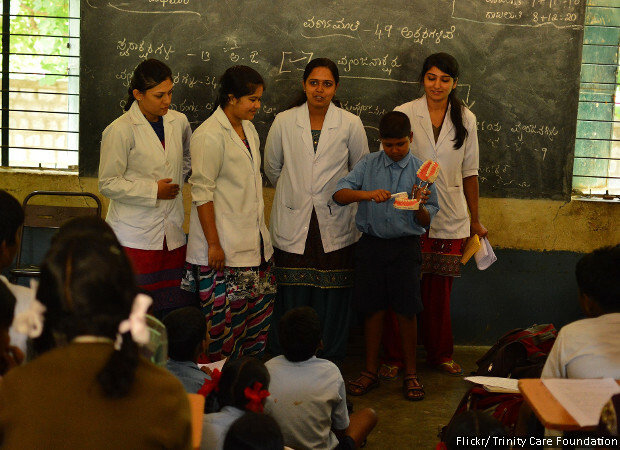 The quality of elementary education has been declining in India, as IndiaSpend reported. Only a fourth of all children in standard III could read a standard II text fluently, a drop of more than 5% over five years, according to the 2014 Annual Status Report on Education.